We have enormously expanded our range of bike parts gradually. For every type of bike there are currently numerous special accessories available. We will maintain the overview for you, and you will benefit from our huge brand variety as well as from our favourable prices. Conveniently order online from us and we will dispatch your bike parts to you, worldwide! Whether it is just a tiny part for the bike or an immensely important attachment without which there is no moving forward, tuning parts for your MTB or just a screw! If you just cannot find the right spare part online, please contact us and we will help you as soon as possible.. Have fun on your discovery trip browsing through our huge offer! Bike parts require regular checks and maintenance. The chain of the bicycle has already aged, the studs are quite worn? No matter whether you use a road bike at high speed in the traffic or a mountain bike, which has to withstand harder assignments off the beaten tracks, the proper function of the bike parts should never be underestimated! Safety comes first, therefore, you should give the parts of your bike the necessary attention! For that reason, a regular inspection by a bike repair shop is most warmly recommended. Particularly suspension elements require regular service in a specialist workshop! A quick check of the most important bike parts prior to each tour start.
! Before you go en route, you should always briefly check your bike. Just a few steps can help discover weaknesses before the tour is even started and consequently can protect you from the worst. The most important parts, which always have to function, are the brakes, the stem and handlebar screws, the headset and the wheels. If one of the parts does not work correctly, you will most certainly take a fall. Always have a close eye on the condition and the proper function of the bike parts! Brakes: Is the pressure point the same at both brakes, even after several activations? Are the brake pads and disks functioning properly? Leakage at the screw connections? Headset: Is there a clearance perceptible? Does it freely rotate? Steering zone: are all screws properly tightened? 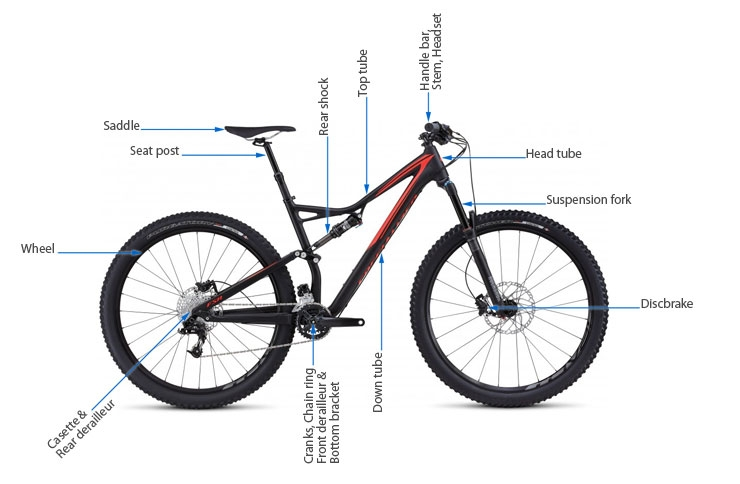 Can the handlebar or the stem be twisted with low force? If that is the case, tighten the screws cross-wise with the correct tightening torque. Wheels: Check the pressure of the tires, are the rims undamaged? Are the bearings of the hubs okay? Concentricity ok? Are all spokes correctly tensioned? Not life-essential, but still meaningful: Is the chain oiled?